Have you ever looked at one of the objects that we use without thinking every day, and wondered who came up with the invention? I do, and yesterday as I was putting the empty coat hangers from my clothes for the day into my closet (yes, Mark, I do remember to do that occasionally!) I suddenly wondered where coat hangers come from. Several websites (all of whom, I think, were copying Wikipedia’s entry) say that Thomas Jefferson was believed to have invented a forerunner of the wooden clothes hanger. However, the foremost authority on all things Thomas Jefferson, the Monticello website, disagrees. According to the Monticello web site, there is no evidence that Thomas Jefferson invented the individual clothes hangers similar to what we use today, but he did invent the most ingenious closet gadget which allowed him to hang and access over 48 sets of coats, waist coats and other clothing easily. 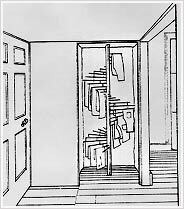 While the device did not survive the ravages of time, the researchers at Monticello, relying on help from The Thomas Jefferson Encyclopedia have come up with a conjectural drawing of what this revolving closet might have looked like. Apparently, one of the first patents for a device similar to today’s coat hangers was issued in 1869 to O.A. North, from New Britain Connecticut. unfortunately, I haven’t been able to locate that patent or the drawing that should be with the patent – records that old at the United States Patent Office are listed by year, classification and patent number only rather than by key word. Over 13,000 patents were issued in 1869 alone! 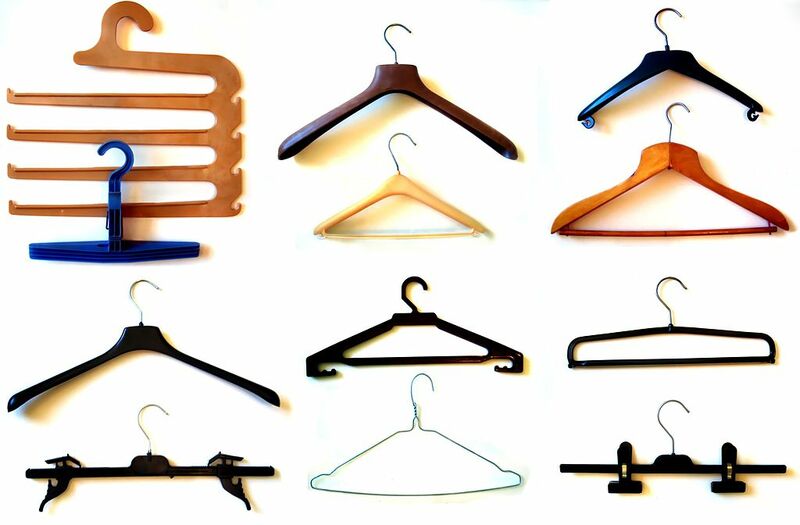 Until 1903, coat hangers were made of wood supported by other materials. The ubiquitous wire coat hanger was apparently first designed by Albert J. Parkhouse in 1903. Parkhouse was an employee of the Timberlake Wire and Novelty Company in Jackson, Michigan. His co-employees were unhappy because the company did not have enough coat hooks, so many of their heavy winter coats would fall to the floor during their work shift. Mr. Parkhouse grabbed a length of wire, twisted it so that one end had a hook on it, there were two ovals below that, and then the other end of the wire was twisted around the stem of the hook. In keeping with the custom of the day, Parkhouse’s employer, Timberlake, patented the idea and reaped the profits. After a few years, Albert Parkhouse (perhaps realizing that it is cold in Michigan in winter and not that cold somewhere else) moved his family to Los Angeles where he started his own wire novelty company. He died at the age of 48 from a ruptured ulcer. Over the years, many other patents have been issued for designs that improved the original one, to where today the variety of coat hangers is overwhelming. However, the wire coat hanger is the champion of them all, beloved by dry cleaners everywhere and collecting in our closets in prolific amounts. 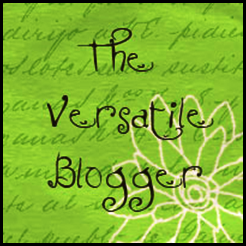 This entry was posted in History, Just stuff..., working mom and tagged coat hangers, Connecticut, history, humor, inventions, inventors, New Britain, North, Parkhouse, Timberlake Wire, working mom. Bookmark the permalink. Way more than I ever knew. Thanks for the insight. Probably more than you ever wanted to know too! 🙂 Thank you! I love this kind of information. Great! I’m glad to know I’m not the only one!